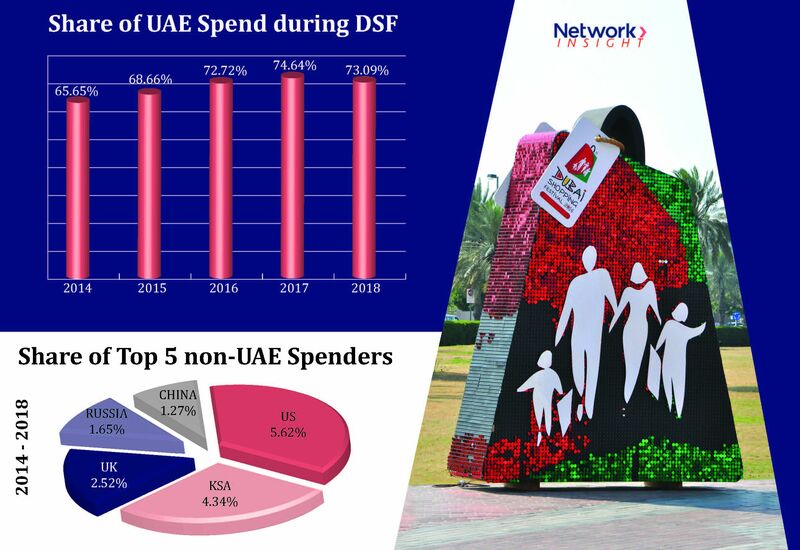 Data from Network International, the leading payment solutions provider in the Middle East and Africa region, indicate that cards spending during the Dubai Shopping Festival (DSF) has continued to increase over the past five years, with spends volume increasing by 6.75% in 2018 compared to 2017. The study showed that since 2014, DSF spends have continued to rise despite global and regional economic headwinds. Spending using credit, debit, prepaid and other types of cards surged by 10.21 % in 2015 compared to the DSF of 2014, and has continued to rise, by 5.39% in 2016, 10.76% in 2017, and 6.75% in the latest edition of DSF in 2018. Domestic spenders accounted for nearly three quarters (73.09%) of all DSF sales, up by nearly 8% percent from 2014 (65.54%). The volume of spending was equivalent to the average monthly amount they spend across the year, testifying to the stability of financial confidence in the country. American and Saudi consumers took up the second and third biggest share of all DSF spends in 2018 at 5.62% and 4.34% respectively. The United Kingdom, Russia and China, Kuwait, Germany, India and France, in descending order, made up the rest of the top non-UAE-issued cards during DSF. For 23 years, DSF has given residents and tourists an annual opportunity to splurge on a wide range of products while deriving maximum value from their shopping. From 1.6 million shoppers thronging the malls for value deals during the first edition of DSF in 1996, to more than 50 million in 2018, the festival is not just about shopping and retail. It is also a magnet for tourists from across the Middle East, North Africa and South Asia (MENASA) region as well as other countries to make their way to Dubai for the family-oriented festival of fun. .